The Congress Thursday accused the government of carrying out an "insidious propaganda" of falsehood against the previous UPA regime over the Agusta Westland chopper deal to cover up its failures. 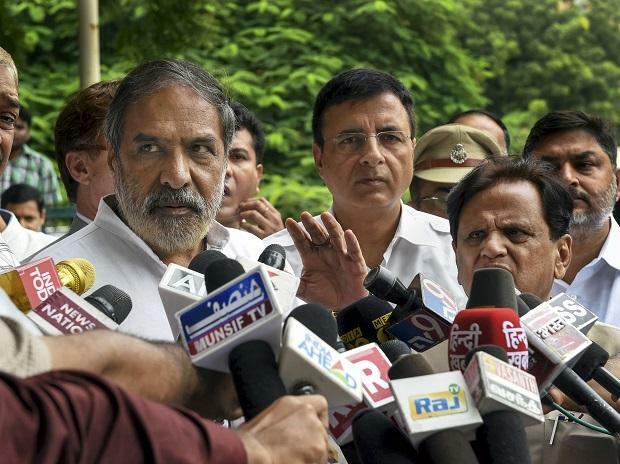 Senior Congress spokesperson Anand Sharma also targeted Prime Minister Narendra Modi, accusing him of being a "front man" for concluding the Rafale fighter jet deal. He alleged the government was misusing agencies to target the opposition leaders and former chief ministers. "I would like to make it absolutely clear, this is an insidious propaganda of this government, which today does not have a fig leaf to cover its failure and betrayal of the people. Their inflated claims and false claims are not going to mislead the people. "They have always carried out a vitriolic campaign, full of falsehood against the previous government. Five years have passed what has come to light? That is my question," he told reporters when asked about the extradition of two more middlemen in the AgustaWestland chopper deal from the UAE. Sharma claimed that action against AgustaWestland was taken by the UPA when some irregularity was pointed out and it also started the process of blacklisting the firm. He claimed the contract was cancelled, bank guarantees and helicopters were seized, and added "we got more money than what would have been paid out and those details have been given to you". "I challenge the government to contradict, what the then defence minister has said, but, under this government, we understand that they are getting hold of some people. "It is between the courts of India, the legal processes, the agencies concerned to determine who has done what and they should be punished. Why are they asking us the questions? And, why Modi ji is not answering questions of Congress chief Rahul Gandhi and our questions on Rafale," he asked. On the government's claim that it does not have any middlemen in defence deals any longer, unlike in the past regime, he said, "Yes, this government does not believe in middlemen, when, the prime minister decides to be the front man in concluding the deal of Rafale." On CBI raids connected with BSP chief Mayawati, Sharma said, "The highest rise in inequality in India is during the tenure of Modi and the BJP government, and there is the misuse of the agencies, targeted political vendetta, because the elections are coming near. They are desperate. They can do anything between now and the elections." Sharma alleged the ED and the CBI have become "handy tools" of the government and it has been a practice of this government to use these agencies at will for targeted political vendetta. He claimed that chief ministers and former chief ministers, except those from the BJP, had been pressured by the agencies. "Why the same ED and CBI have not taken cognisance of very serious charges against the BJP chief ministers and the corruption which was uncovered in Maharashtra? And what about their chief ministers and former chief ministers now in Chhattisgarh, Rajasthan and Madhya Pradesh," he asked. Sharma claimed they had destroyed the credibility of the CBI and the ED. "We have cautioned them, I did so personally telling these agencies to act within the ambit of law. I am not saying they should not do their work, but they should not do the bidding of the present government to target their political or ideological opponents," he said. The Congress leader claimed that it was not acceptable to the BJP government and leadership that agencies be told not to be misused and abused, and to act as per law. Referring to his previous warning given to CBI officials for targeting political opponents, Sharma said, "I did not rebuke, I cautioned. They (BJP) have rebuked because they abused them, then they rebuked them and then they question our right to expose them." He was referring to Finance Minister Arun Jaitley's recent remarks against "adventurism" by probe agencies. The Congress leader alleged that in the last financial year ending March, 2018 of the Rs 295 crore of electoral bonds that have been purchased and donated to political parties, Rs 290 crore have gone to the BJP as per the filing. "This government has been spending Rs 4,000 crore only on advertisements since January 15 and it will go on until March as and when the elections are announced. This is the amount, to mislead the people about making false claims of achievements. "The BJP as a political party is the highest advertiser, beating top multinationals and corporates. Beating Netflix, Amazon, Unilever, TATAs and Reliance put together. Rs 4,297 crore is the BJP's advertising budget which is available in public domain and I challenge them to deny it. That is where your black money is," he said.